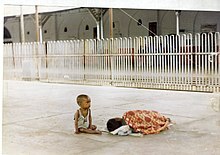 A street child in Bangladesh is someone "for whom the street (in the widest sense of the word, including unoccupied dwellings, wasteland, etc.) has become his or her habitual abode and/or source of livelihood; and who is inadequately protected, supervised, or directed by responsible adults”. Street children do not go to school; instead they sell things in the streets or do other jobs as their parents earn less money or do not work. It is estimated that there is more than 600,000 street children living in Bangladesh, 75% of them live in the nation's capital, Dhaka. In a country ranked 138th on the Human Development Index and where 50% of the population is living below the poverty line, these children represent the absolute lowest level in the social hierarchy, in the world's most densely populated nation. Nowadays the population in this country increased, and the number of street children has also increased to an estimated 4 million. There is currently no official statistic of the number of street children in Bangladesh. It is nearly impossible to count their numbers as they increase by years. There is not any specific age of street children in Bangladesh. Some are 6-12 who sell things and some are 13-15 who do other jobs. Children under 5 can sometimes sell things or just roam around the streets. Most of the female street children are married from the age of 10, which leads them to a very difficult life. Other male children have to work hard to run their families. The street children have no particular living or sleeping place. They can sometimes be seen selling flowers on the street. Many of the street children in Bangladesh die young as they are not properly taken care of. 110,000 children die of water-borne diseases annually each year. They are incapable of buying healthy foods. They sometimes eat foods which are not hygienic. Sometimes they will starve looking for food. Street Children often don't have the means to earn money as they are not educated. Government organizations sometimes help them. Most often it's non-government organization which help them, like The United Nations Children's Fund (UNICEF). There are also some small non-government organizations such as Bangladesh Street Child Foundation, Street Children Activist Network, Children's Heaven, JAAGO Foundation, Bangladesh Street Child Organisation, Mojar School, Obhizatrik Foundation, SOMBHABONA, etc. in Bangladesh. Some organizations also requests other people to donate for the street children. INCIDIN Bangladesh has been working for the development of the street children especially those groups who are abused and exploited sexually. Along with the regular activities, the organization is happy to celebrate the International Street Children Day 2012 with the support of SCI. The International Day for Street Children was launched in 2011 by the Consortium for Street Children (CSC), the leading international network dedicated to realizing the rights of street children worldwide. The day is celebrated by street children, NGOs, policy makers, celebrities, corporate and individuals across the globe. The street children in Bangladesh are unable to go to school and as a result, they do not get proper education. It is very important for them to study as they will find themselves spending the rest of their lives miserably. The non-government organizations help them to be educated. ^ Thomas de Benítez, Sarah (2007). "State of the world's street children". Consortium for Street Children. Archived from the original on February 22, 2012. Retrieved February 20, 2012. ^ Children in Bangladesh. "Street Children - Bangladesh". ^ End Poverty in South Asia. "World Bank Blogs". ^ "Ten Facts about Children in Bangladesh". Children of Bangladesh. Bangladesh Development Research Center (BDRC). ^ Crime is the best of many options. "D+C". ^ "Some Organizations that Help Children in Bangladesh". Children of Bangladesh. Bangladesh Development Research Center (BDRC). ^ Celebrating Victory through Volunteerism 2013. "One Degree Initiative". ^ Donate today to keep Global Voices strong!. "Global Voices". ^ Study reveals inadequate access to EmONC facilities in 24 districts of Bangladesh. "icddr,b". ^ Celebrating International Street Children Day 2012. "INCIDIN Bangladesh". ^ JAAGO Schools now powered by Bangladesh’s first ‘Online Classroom’!. "JAAGO Foundation". ^ Bangladesh: Helping the street children of Dhaka. "Plan UK". 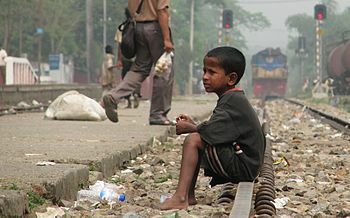 Wikimedia Commons has media related to Street children in Bangladesh.